An other week, an other great newsletter. If you have missed last week newsletter, check it out. I'm a twitter fanboy. I don't tweet much but I have followed great people over the years. Most of the resources I share in this newsletter comes from Twitter. PS - Please reply to this email and let me know if you want me to share interesting tweets like the one above every week. "Because the growth team was able to do this without having to ask for involvement from design, engineering, or analytics, each team at AdRoll had the time and resources they needed to keep working efficiently. 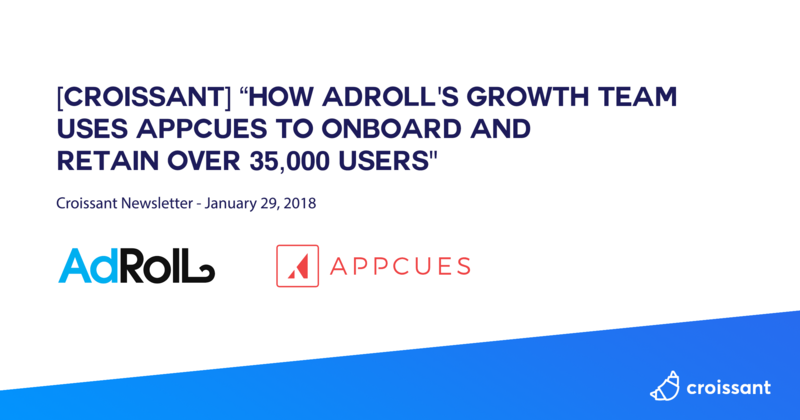 At first, AdRoll was able to use Appcues to test out small changes to their onboarding flow that increased user adoption for specific integrations and features. But to achieve their goals of helping and retaining customers, AdRoll has looked for broader, more holistic ways to optimize their customer experience for self-serve users. According to Peter, when it comes to driving product growth, “Appcues fits perfectly across these three metrics.” The team has found ways to implement Appcues experiments and make optimizations to drive all three of these metrics—so that they're promoting growth at every stage of the customer lifecycle. " "When I started there was just a consumer product team, and there was a growth marketing team that was mostly marketing. What I quickly realized as I was running the consumer product team was that we didn’t have very good visibility into user behavior. The amount and quality of instrumentation weren’t quite there, so the growth team really started as the growth engineering team. It was myself, a PM, an analyst and one engineer for the first three months, and we had to lobby pretty hard to start the team. We just tried to fix data, so we put together a growth marketing stack and an analytics stack. We tried to validate every single event that a user could possibly do. For a few months it was a struggle, because we had a team called growth, and we weren’t growing anything, which you can imagine is not the best place to be when you just joined a company. We tried to validate every single event that a user could possibly do. Once we instrumented most of the customer events and we can see where we are, and what people are doing – as you can imagine if the data wasn’t quite good before – there’s probably a ton of low-hanging fruit. We started chopping that low-hanging fruit down on the sharing side and on the onboarding side and it was very significant. Through that you get a little bit more credibility and trust with executives. That’s how growth marketing was folded under growth. Then performance acquisition was folded under growth and we became a proper growth team as opposed to just a growth engineering team. " "SEO teams are part of a growth organization to drive additional (free) traffic & visibility in organic search to boost the business. They apply content/link/keyword research, technical audits, content creation and the ability to do massive PR/Awareness/Brand campaigns to help boost this. The best SEO teams are formed by being cross functional (designer, content, SEO, engineer). The most support they’ll need is from tools, budget and from their C-level (top down). With all of this they can do a great job in helping you create beautiful new products, run experimentation and apply massive data sets on helping to grow the business. They’re not focused on old school SEO: chasing links, creating scrappy content. But by supporting other teams and leveraging their ideas to build out new ways to boost organic search visibility. [Article] Does a North Star Metric Oversimplify Growth? "I define a North Star Metric (NSM) as the single best metric for tracking accumulated user value for a product over a time period. In other words, it is a company-wide metric for tracking sustainable growth. The concept of One Metric that Matters (OMTM), as I understand it, is not the same thing as North Star Metric. I first learned about OMTM from the book Lean Analytics by Alistair Croll and Ben Yoskovitz. They define OMTM as the “one metric that matters — right now.” In other words, what is the one metric that is most broken at this moment in the company or for a given team? I think this is a useful concept to bring focus to a team. But without combining it with an NSM it can lead to some potentially haphazard chasing of metrics. North Star Metric is important because without expanding value, growth of any other metric is unsustainable. " "The first step many founders think to take when they are in need of media coverage is to hire a PR agency. But most of the good ones want a $20K a month minimum retainer fee. There are options for companies who aren’t ready to shell out for this, Carmichael says. One option is to invest time in your own execution. Particularly if you're at an enterprise company, or not needing to get a huge press round to reach your goals, you can run your own PR strategy. Her key guidance: Think about PR the way you think about product. This Brand Strategy Can Make Your Startup Look Bigger Than It Is “People develop products to create a solution to a problem,” she says. “So ask yourself: What do the customers for your solution really need? What’s the language that they speak (i.e. what is in their regular vocabulary)? What’s going to resonate with them? You would evaluate all the same things to craft a good product. Now, your challenge is to craft a story that resonates with them.” This is where everything has to start, regardless of whether you’re working with an agency or not. " "Personalized messaging” is one of the most overused phrases in marketing today. To some, it’s a matter of voice and tone. Be friendly. Use more emojis. To others, it’s a spectrum of hyper targeting. Stuff as many unique identifiers as possible. Both are right, but miss the boat. Personalized messaging is all about relevance– sending a specific, valuable message to the right person, at the right time and place. When done effectively, these messages prompt important user behaviors like starting a free trial or checking out a new feature. It’s an abstract concept that in reality is super simple. Case in point: these seven real-life examples of high-converting in-app and proactive live chat messages. We chose messages that address a fairly wide range of business goals, like converting trial users to paying ones, addressing churn or improving app engagement. " Sorry, there was an error. Please try again to subscribe. [TGB] What’s next in growth?